Of all the pieces of gear that needs to be acquired for a functional project studio, the microphone – covered in the first article of this series – is perhaps the most straightforward. It’s got one job. To get it to work, you just plug it in, point, and shoot. Further down the line, however, things get a little more complex. The next stop along the way – the audio interface – can be a simple affair, or exceedingly complex. To use a laboured metaphor: if your digital audio workstation (DAW for short) software is the brain of your setup, then the audio interface is its beating heart, pumping signal throughout the the studio’s nervous system. Aside from being a way to simply hook things up, the interface can add distinct personality to microphone signals via preamps, provide virtual guitar amplification, send MIDI signal to and from pieces of hardware and more. In a DAW based project studio, the audio interface has replaced the console. It’s the hub through which all sounds are routed, so read on as we explore the ins and outs. The audio interface can facilitate multiple roles in the project studio, but its essential purpose is to convert analog audio signal to digital audio signal. When you make noise in front of a microphone, the movement of the diaphragm (or the ribbon) creates voltage. The voltage is carried down the microphone cable to the audio interface, where the analog to digital converter transforms the electrical charge into the ones and zeros of digital speak. This means that it can be recorded by your DAW. The interface will then do the job of converting the digital signal back to an analog one. This conversion stage is required for you to monitor the sound through speakers or headphones. Therefore, interfaces are typically labelled ADA (analog-digital-analog) converters. Many an hour can be lost in audio forums discussing the quality of converters. If you have a well trained ear and a listening environment of exceptional fidelity, the difference between different brands of converters will be more obvious. In a project studio context, however, other factors are more likely to contribute to the success of a recording. Microphone preamps add gain to a weak microphone signal – a non negotiable link in the chain when recording with microphones. Though its job is a simple one, preamps undoubtedly colour the microphone signal. Professional sound engineers spend entire careers concocting specific combinations of microphones and preamps to suit the individual character of a performer. So needless to say, they’re important. Many standalone analog preamps that take their design cues directly from hitmaking consoles have been developed. But for anyone without deep pockets, or who aren’t working in the field professionally, these little gems can be prohibitively expensive. Many audio interface manufacturers prize clarity above all other qualities of sound. Others laud to the analog-like qualities of their preamps’ character. For example, Universal Audio have gone to great lengths to achieve the same character as original vintage hardware in their Apollo series. Audient have taken a different route, inserting a real valve into their guitar friendly interface, Sono. Whereas Apogee is famous for delivering a pristine, unblemished signal path in their interface preamps. Is too many channels ever enough? Yes, having an abundance of channels to plug in enough mics to record an entire drum kit, electric guitars, bass, keys and vocals is without doubt, awesome – however, the more channels you have, the pricier it gets. Now, this can be a conundrum. You might only need one or two channels now, but what if your studio expands? You might not want to track a full drum kit in your project studio, but you might want to incorporate a host of synths, drum machines and other electronic elements into your productions. Also worthy of consideration are outputs. Every interface will have at least one set of stereo outputs for monitoring. Some will have main monitor outputs, plus a headphone output. Some will also have extra line outputs. When do these come in handy? Many engineers prefer to have multiple sets of monitors for getting a different perspective on mixes, which require additional outputs. You’ll need extra outputs for running external effects or setting up a reamp channel. Depending on your DAW, you can even create a surround sound system. In other words, having more outputs can facilitate the expansion of your sound palette. As with microphones, there is a lot to consider when looking at an audio interface. The amount of available options are mind boggling, so it’s helpful to keep your primary objective (making music!) in mind. 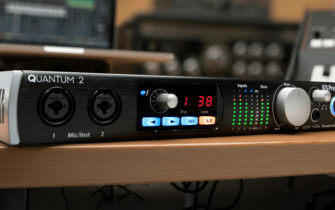 The best audio interfaces facilitate a fluid production workflow, are dependable, and sink seamlessly into your system. So, listen deeply, find out more about mic preamps and figure out what gear you want to have plugged into system when inspiration strikes.